The first of the books I hope to complete in the 100-day challenge is nearly ready. This would be the fifth book in my African Fireside Classics series. 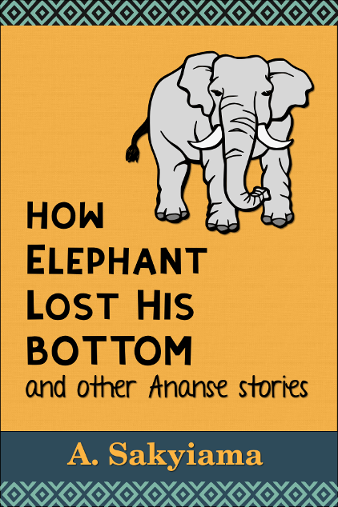 It’s entitled, How Elephant Lost His Bottom and Other Ananse Stories. Here’s the ebook cover! It’s going through the final proofing before release. I will post a formal announcement when it is approved for sale in all the major online bookstores. I designed the cover in Inkscape. It has a different look from the earlier books in the series. Since I liked this look better, I tried my hand at redoing some of the other covers. I redid the covers for Today’s Water and The Missing Mouth. This is what I have so far. I’ll continue tinkering. So, the next few weeks will see not only new books, but, improved looks and a little extra content in the older books as well. If you want to be notified first when new books come out or when older ones get an update, please sign up for my email list. It’s free and I do not share your email address.